Sweet sticky caramelised vegetables, a spiced vinaigrette and soft smooth milky mozzarella. 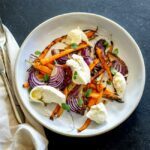 This Spiced Carrot, Red Onion and Mozzarella Salad is the salad for people who don't like salad. The carrots are nutty and sweet, the onion is sticky and fragrant, the dressing perks everything up and then then mozzarella calms and cools. The perfect salad for so many occasions. Peel the onions and leaving the root in place cut them into thick wedges. Drizzle with half of the olive oil, season with salt and pepper. Line a second tray with cooking paper and add the carrots, drizzle with the remaining olive oil, season with salt and pepper. Again make sure the carrots are spaced out in a single layer. Roast the carrots and onions for a 25 minutes until tender and caramelised. Pour the extra virgin olive oil into a shallow pan or skillet. Add the coriander seeds, fennel seeds, peppercorns, whole star anise, and red chilli flakes. Peel the garlic but leave it whole, add it to the oil. Place the pan/skillet over a very low heat and let the spices cook in the oil for 4 minutes, make sure the spices don't burn as then your dressing will be bitter. Remove from the heat and allow to cool slightly before storing in the red wine vinegar and honey. Remove the star anise and whole garlic before serving. Transfer the roasted veg to a platter, drizzle over a little of the spiced dressing and then tear over the fresh mozzarella. Garnish with fresh oregano and an extra sprinkling of salt. Cook the carrots for 10 minutes before you add the tray of onion wedges.